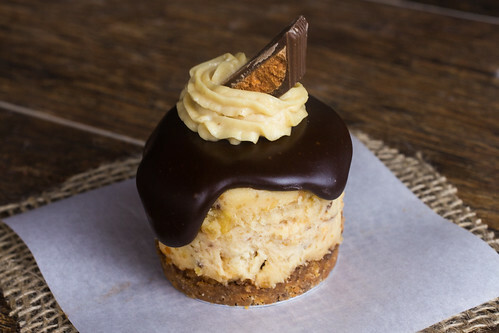 Peanut butter and chocolate go together like Sunday and football. So when I had the chance to try out the all-new Butterfinger Peanut Butter Cups, I was super excited. This candy is so yummy — I may have found my weakness. 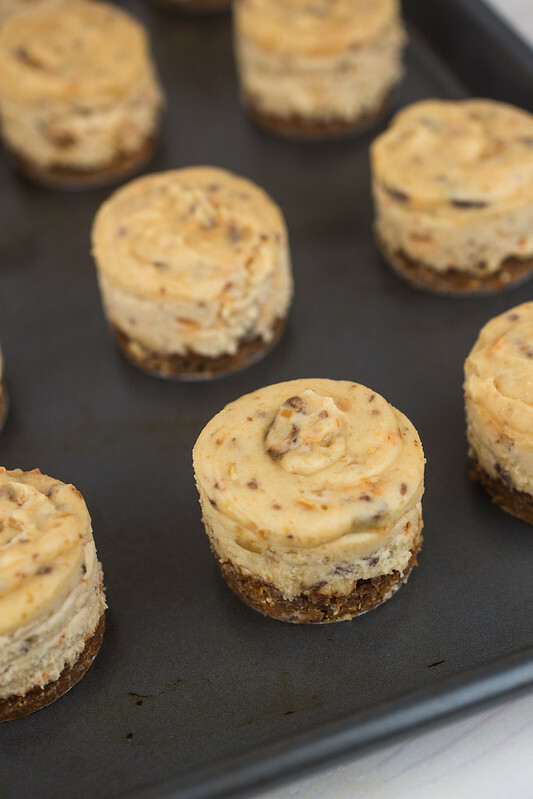 I decided to add them to a mini cheesecake recipe that would be perfect to serve at your next gathering. Hosting a get together to watch the Big Game? 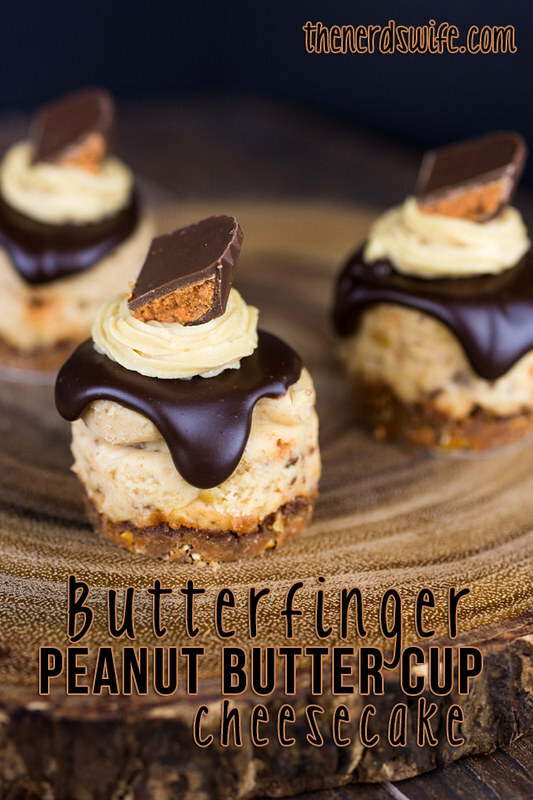 Stop by Walmart and pick up the supplies to make these Mini Butterfinger Peanut Butter Cup Cheesecakes. They’re perfectly sized for individual servings and they would be a great addition to your party menu! 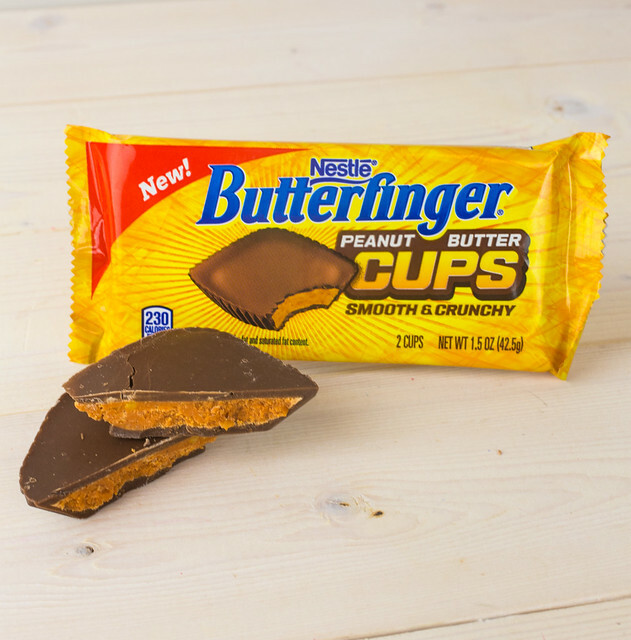 I really love the texture and flavor of these butterfinger cups. 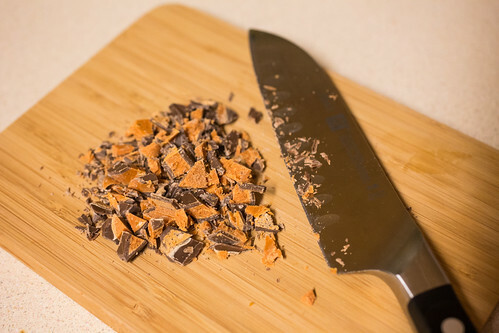 There’s a bit of Butterfinger crunch in just the right places. So yummy! 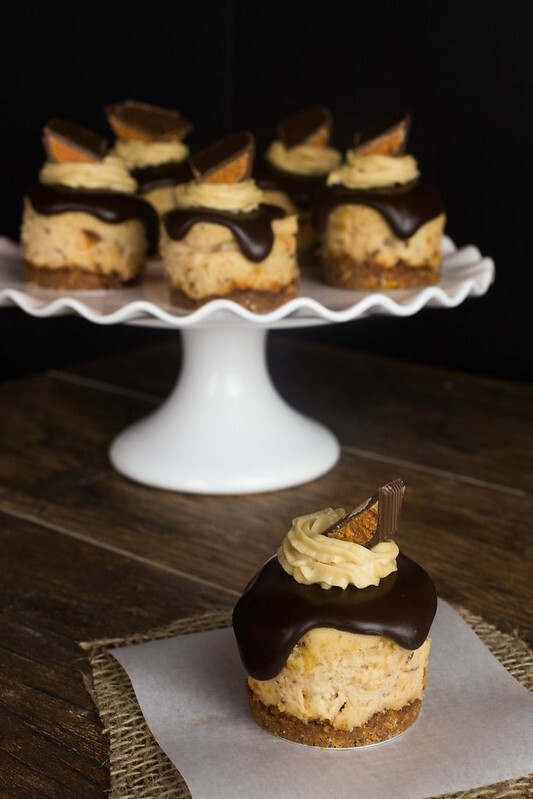 These mini cheesecakes accentuate that flavor with bits of butterfinger cups mixed in, some chocolate pouring glaze and a dollop of peanut butter cream cheese frosting. They are seriously delicious! Preheat oven to 350 degrees F. Chop up the Butterfinger Peanut Butter Cups and add them to a food processer with the pretzels. Pulse until mixture is finely chopped. Press into the bottom of a mini cheesecake pan (I used this one). Bake crusts for 7 minutes and set aside to allow to cool completely. Meanwhile, make the cheesecakes. Place the heavy cream in the bowl of a stand mixer with a whisk attachment and mix on high until medium peaks form. Set aside. 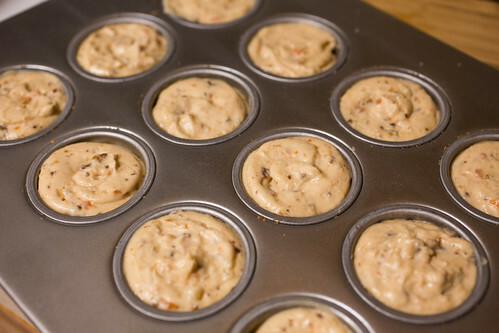 In a separate bowl, beat together the cream cheese, peanut butter, salt, sugar and pretzel mixture until smooth. Stir in the chopped peanut butter cups. Don’t they look so yummy? Pour the cold water into a shallow bowl and add the gelatin. Set aside for 5 minutes and allow to bloom. Put the bowl in the microwave and heat for 10 seconds at 50% power. The mixture should be liquid and steaming, but not boiling. Add one tablespoon at a time to the cream cheese mixture, stirring after each addition. Then, fold in the heavy cream mixture. Transfer to a pastry bag and pipe the cheesecake mixture into wells. Refrigerate for at least six hours; overnight is best. Remove the cheesecakes from the pan. Once the cheesecakes are set, it’s time to prepare the chocolate pouring glaze. Add the chocolate and heavy cream to a double boiler over a pot of boiling water. Allow to sit — without stirring — for two minutes to melt. Stir slowly — the mixture will be thick. Add in the powdered sugar — it might almost seem solid now. One tablespoon at a time, add the warm water until the desired consistency is reached. Spoon the glaze on top of the cheesecakes, allowing a bit to drip down the sides. Return to refrigerator while you make the peanut butter frosting. Mix together the cream cheese, peanut butter, powdered sugar and milk until smooth. Add to a pastry bag and pipe a dollop of frosting on top of each cheesecake. 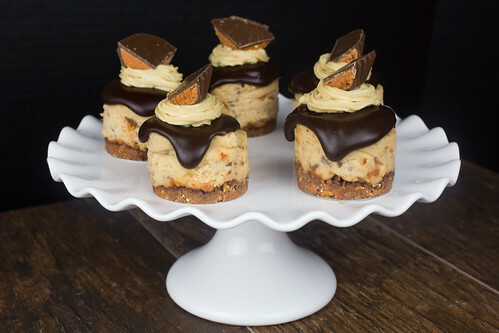 Garnish with pieces of Butterfinger Peanut Butter Cups. Refrigerate until time to serve. And don’t miss their appearance during the Big Game!